Interactive workshop exploring the (im)possibilities for radikal queer activisms in times where the political LGBTQI agenda is increasingly taken over by right wing groups and multinational corporations. Historically queer struggles in several parts of the world emerged as part of a broader radical societal critique. 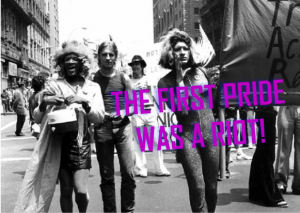 For many of our queer ancestors the struggle for sexual and gender liberation was linked to resistance against capitalism, connected to the construction of a broader left alternative where all would be equal and free of discrimination, oppression and exploitation. Because of the struggle of these queer godmothers, it has been mainly the left of the political spectrum, that started to open up and integrate LGBT issues on the political agenda (such as in left political parties, in unions, in other left wing social movements). In the last decade however, LGBTIQ struggle, is not mainly a left project anymore. We see right wing parties and groups adopting a certain LGBT agenda. Additionally a powerful newcomer, claiming a place in the struggle for LGBTI rights, is the transnational corporation. Multinational enterprises such as ING Bank, Google & Uber are increasingly vocal on LGBTI rights, they become ever more visible in- and around Pride celebrations, organizing congresses on LGBT issues, realizing research projects and funding development projects around LGBTI issues. This shift poses new challenges to radikal LGBTIQ+ activist groups and movements. After all: in a context where the LGBTIQ+ rights agenda is increasingly being addressed by the right and corporate networks, what are still the (im)possibilities for queer activisms that see queer liberation as part of a radikally different (anti-capitalist) society? How do we deal with these corporate powers high-jacking ‘our’ political agenda? And how is this related to a broader political shift where right wing groups are increasingly saying to defend LGBT right? How to create a new left wing LGBTIQ agenda that is both radikal as it is inclusive and intersectional? Increasingly urgent questions as corporate LGBT networks seem to be growing and mainstream LGBT organizations are moving to the political right. This workshop will address the above stated questions, exploring the (im)possibilities for radikal queer activisms in current times of LGBT conservatisms. We will do so analyzing the discourse and practice of ‘the corporate-case’ for LGBT rights and explore possible radikal activist responses. Additionally we will exchange ideas on possible effective and relevant ‘counter-tactics and strategies’ within a broader left queer agenda. We will do so based on examples from past and present queer activisms in the Netherlands and beyond. Among others we will discuss the “Reclaim our Pride actions” organized during the Pride celebrations in 2017 in different cities in the Netherlands. Hopefully we will end the workshop with some concrete ideas on strengthening queer opposition to corporate Pride. WE RECLAIM OUR PRIDE This is an initiative of queers all over the NL, aimed at reclaiming our Prides in all the cities, prides that have been taken over by commercialization, capitalism, pinkwashing and other forms of exclusion and un-equality.